“Church” is a word that has suffered the death of a thousand indignities, many of them self-inflicted. The word does little more now than name an irrelevancy, a blasphemy, or danger for many in our culture. It badly needs rehabilitation of its identity and integrity. Essential is a fresh image that captures what church is about that has been lost or obscured and rendered in an idiom that recaptures the sharp edge of its calling. In America, I contend, that image is the church as God's “Subversive Counter-Revolutionary Movement” (SCRM). According to Pew Research, most Americans believe the economic system unfairly favors the wealthy, but 60% believe that most people can make it if they’re willing to work hard. Credit: Allan Danahar via ThinkstockBehavioral Finance: Using Psychology in the Market In a candid conversation with Frank Rich last fall, Chris Rock said, "Oh, people don’t even know. If poor people knew how rich rich people are, there would be riots in the streets." The findings of three studies, published over the last several years in Perspectives on Psychological Science, suggest that Rock is right. We have no idea how unequal our society has become. It should not be the fickle attention of Western media that determines who appears as the subject of care. Uncoupled from contemplation of Christ crucified, we misperceive what suffering looks like. Credit: vincent desjardins / Wikimedia Commons From pictures of poor farmers in Depression era America to bloated children in Sudan, the contemporary aesthetics of poverty subtly reinscribe the ancient division between the children of the soil (chthonoi) and children of the gods (theion) familiar to us from the Greek and Babylonian myths. Those who live some form of what is often deemed the ideal "Western" lifestyle look down from Olympus with sympathy on the sons and daughters of the soil and their visceral imprisonment to nature and necessity. Photo: AP Photo/Tony Dejak 2016 ElectionMarch 27, 2015 182Tweet 3.5kShare By Elizabeth Stoker Bruenig@ebruenig Photo: AP Photo/Tony Dejak Ohio’s governor John Kasich certainly won't be president, nor even receive the Republican party’s nomination in 2016. But if Kasich does throw his hat into the increasingly packed Republican primary ring (as some sources suggest he intends to do), the long-term outcome for American politics could be even better than a hypothetical win. This is because, unlike his Republican competitors, Kasich takes Christian politics very seriously. For years it has bothered me that, although the majority of churches in America have fewer than 300 people, most church leadership advice comes from pastors of huge churches. The assumption that bigger is better pervades the church leadership culture. What if that’s the wrong tack? Here are five reasons your church might be better off focusing on faithfulness instead of success… even if it that means it will Shrink. A common perspective among political conservatives, especially of the libertarian and Tea Party varieties, is that welfare is a drag on economic growth and it is a disincentive to initiative. Paul Ryan wants a safety net and not safety hammock. Some libertarians don’t even want the net. It would be better to let people assume their own risks. Money taxed away by the government is money that people could have used to buy goods and services and boost the economy. I am the true ‘swinging voter’. In the numerous elections of my life (beginning with the Federal election of July 1987), my personal votes have been fairly evenly split between Labor and The Liberal, or Coalition, parties. In what follows, then, I have no agenda. The last thing on my mind is to influence which party you vote for. 3/26/2015 Branson Parler 1. Their straight orientation will most often be a source of life-long temptation and struggle. ﻿Although straight Christians should grow in holiness over the course of their life, they will most likely never reach a point where their orientation ceases to be a source of temptation in one way or another. So we must demand life-long vigilance against the temptation to simply do what feels natural based on their orientation. ﻿ 2. Straight people have been told that their sinful lust is just a normal part of human sexuality. It's not. Humans have been created by God as sexual beings. But proper sexual desire is not the same as sinful lust that uses another person as a means to the end of pleasing oneself. Lust is a problem across the board. Straight lust does not somehow have a privileged standing with God because it's straight. Ted, Ted, Ted, my beloved but confused son! I heard your speech the other night. Actually stayed awake through it. I don't usually make it through political speeches these days. But, as I say, I listened to yours. I listened because you never seem to have gotten the distinction between being an American Christian and a Christian American. And because of that you get most everything else wrong or out of balance. I love you, boy, but you need to get clear on this! It matters whether the “Christian” is the adjective or the noun. Nouns are the primary thing which adjectives modify in one way or another. An American Christians is what I intend you to be, but you keep insisting on being a Christian American. And as I already said, that makes you get everything else out of whack. To wit, Ted, if you were an American Christian rather than the Christian American I heard you proclaim yourself to be the other night. Allan R. Bevere I keep coming back to this issue of violence in the Old Testament on this blog because I have two concerns--one as a theologian, and the other as a pastor (I'll get to that a little later). 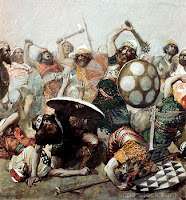 Of late there has been a resurgence of a kind of quasi, neo-Marcionite reading of some of the Old Testament texts that simply dismiss difficult themes, in this case, God's participation in violence, particularly in the conquest narratives in the Old Testament book of Joshua. These texts are viewed as incompatible with the revelation of God in Jesus Christ in the New Testament, so they are simply to be dismissed as primitive projections of a primitive tribal people. I have suggested in a previous post that a Christological understanding that leads to such a view of these Old Testament texts is itself based on a deficient Christology. People who worry about the hellenization, or greekifying, of Christianity tend to worry about Platonism. But the interaction with Stoicism has been equally complex and interesting. Clement of Alexandria (ca 150-215)’s fascinating book Paedagogus is a great early example. The title is variously translated as Tutor, Educator, Instructor, or Teacher of Little Children. etc. It’s a work of Christian ethics, but it incorporates so much from Stoic thought that about a century ago, when form critics were enjoying the apex of their credibility, they hypothesized that it was nothing more than a lightly revised Christian version of a lost work by the Stoic lecturer Musonius (see Charles Pomeroy Parker, “Musonius in Clement.” Harvard Studies in Classical Philology 11 (1901): 191-200). The fact that such a hypothesis could be entertained at all does at least indicate just how pervasively Clement’s Paedagogus uses Stoic terms and ideas.